Hollywood came together on Monday to raise money for Haitian earthquake relief. A group of 80 singers and actors performed an updated recording of Michael Jackson's hit "We Are the World" at L.A.'s Henson Studios. The event was organized by producer Quincy Jones and singing legend Lionel Richie, who co-wrote the song with Jackson. 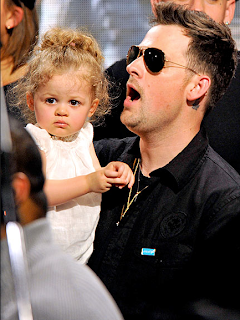 Richie turned the event into a family affair, inviting daughter Nicole, her partner Joel Madden, and their adorable daughter Harlow, to join in. The song will make its world premiere during NBC's coverage of the Vancouver Winter Olympics on February 12. The song and the accompanying video, shot by Oscar-winning "Crash" director Paul Haggis, will go on sale through traditional and online retailers.